Nitpick CI is a dead simple single-click tool for making sure submitted Github pull requests adhere to the PSR-2 standard. Unfortunately, Nitpick currently only works with these two specific (but popular) vectors – only Github, and only PSR-2. It’s free for open source projects, so let’s give it a try. To test Nitpick, we’ll create a brand new repository based on thephpleague/skeleton and pretend we’re building a new PHP package. The skeleton already respects PSR-2, so it’s a perfect candidate for an invalid PR. Feel free to follow along! 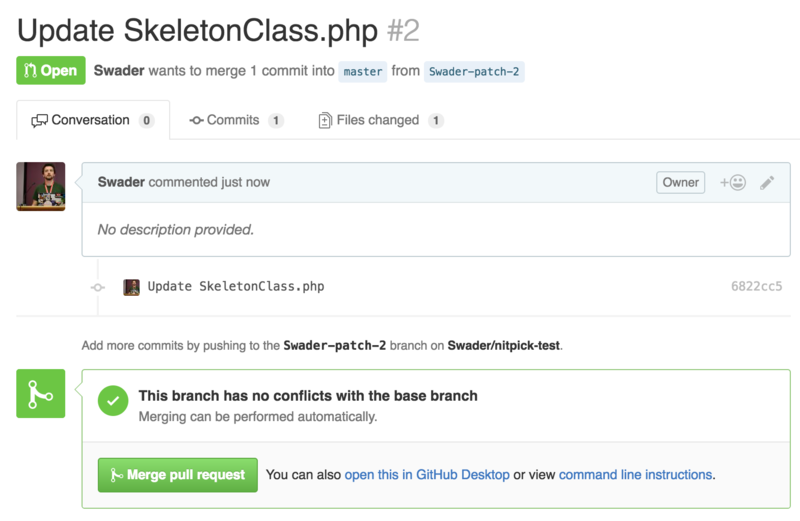 The above commands clone the skeleton, replace placeholder values with real values, and delete some files we don’t need. 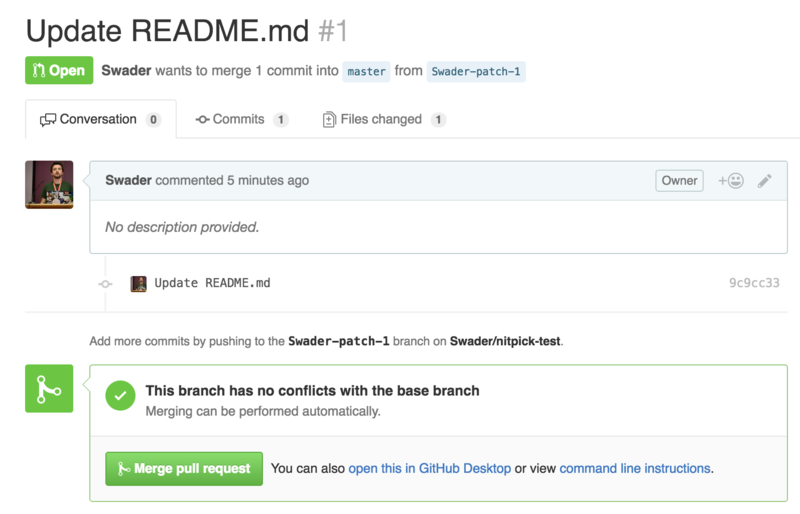 The project is now ready to be committed and pushed online (as long as you created a repo on Github). We can now tell Nitpick to track it. Once authorized to look at an account’s repos, Nitpick will offer a list with a single “Activate” button next to each. There’s even a handy search field for instantly filtering the repos list if you have hundreds. One click on the Activate button, and that’s all it takes. Nitpick is now watching the project for PRs and automatically scanning them. Let’s give it a go! First, let’s test this on non-code PRs and see how Nitpick will react. We deleted the CONDUCT file in the first steps of this tutorial, but we failed to delete the reference to it from the README file. There’s also a “note” at the top of the README file that needs to be removed. As expected, the PR is left untouched – nothing really happens and we can merge it. The file has no code to inspect, so no notifications are issued. Now, let’s add a change to the sample controller. The change should be minimal, just to see if Nitpick will do anything. For simplicity, we can use the web UI again. And again, nothing happens. Is Nitpick even working? We’ve added two properties, of which only one is defined according to rules. The other is missing its visibility declaration. 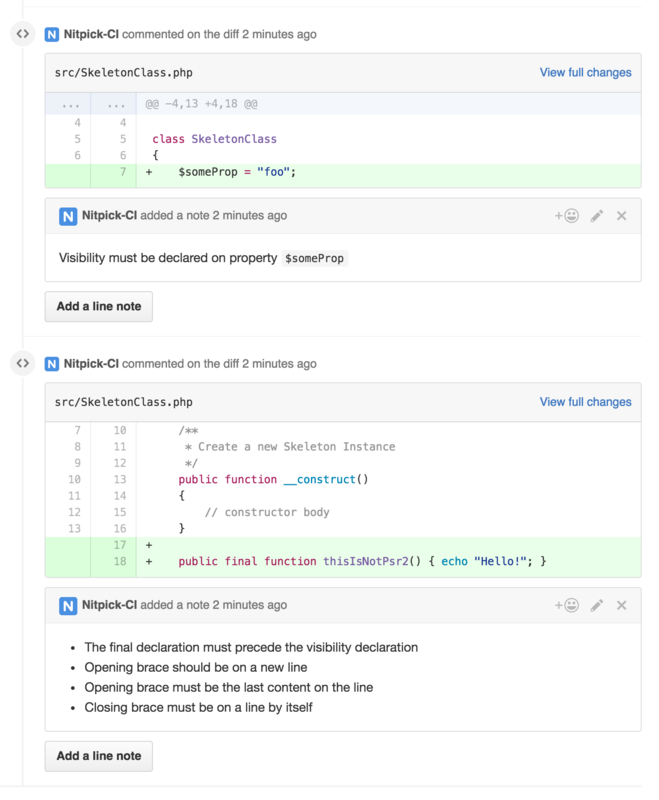 Furthermore, we added a technically valid but standards-invalid method which defines its finality after the visibility, and then has its entire body in the same line as the method’s declaration. Lastly, we extended the previously added suffix to an extreme length. Nitpick displays the mistakes inline, specifically pointing out what’s wrong – whether it’s just one offense or multiple ones as in the case of our added method. 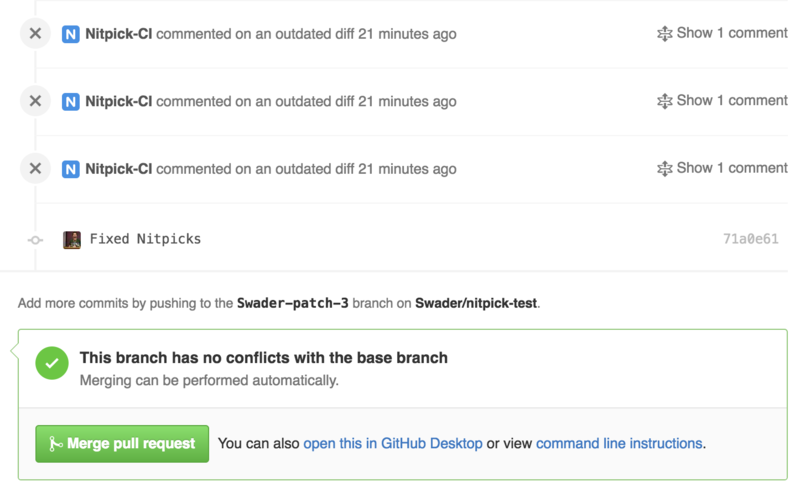 git commit -m "Fixed nitpicks"
Our PR is now ready to be merged! While Nitpick is, admittedly, very specific in its use case, it’s also very good at it – it does one thing, and does it well. 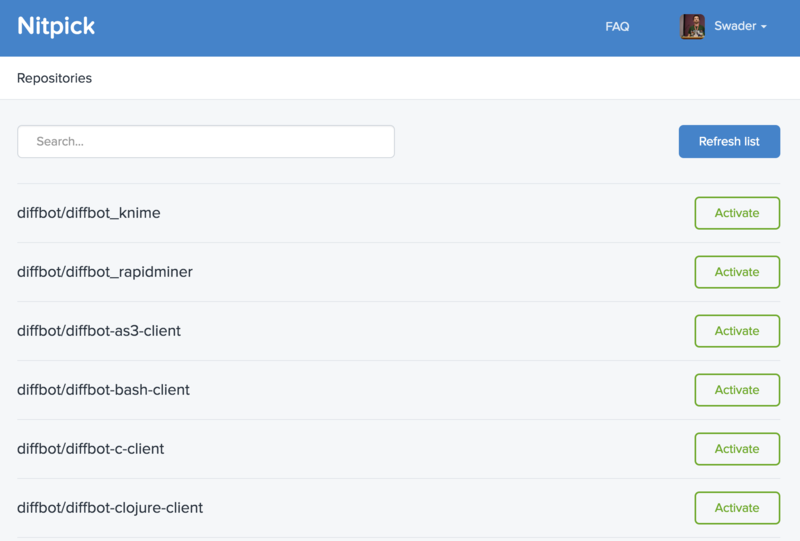 A single click is all it takes to configure it, and the entire team benefits from advanced standard inspections which can now be left out of other CI tools like Jenkins and Travis, instead letting them focus on actual tests. Being free for open source and incredibly easy to set up, there’s truly no reason not to give it a go. due to Nitpick using PHPCS under the hood, we’re constrained by what the tool can do. Not only that, we’re also constrained by the tool’s interpretation of the PSR-2 rules. There’s no way to customize the ruleset, or to define a different implementation of the standard (for now). when mistakes get introduced, there’s no blocking indicator in the PR. CI tools like Travis and Scrutinizer do this really well in that they work together and use the PR’s readiness indicator to mark a build fail or pass. While code standards have no real effect on a build’s technical realization passing or failing, it’d be nice to have some more visual feedback in the spirit of those tools. when mistakes get fixed, there’s no clear indication of the issues having been rectified. I like Scrutinizer‘s approach there – clear indications in the PR, and an email saying some issues were fixed. This gets sent to the entire team, so everyone’s immediately on the same page. That said, I’ll definitely activate Nitpick on all my open source projects – there’s just no reason not to. As a heavy PSR-2 user, I can leave the standards checking to Nitpick and forget all about it in tools like Travis and Scrutinizer, instead letting those tools focus on what matters – code inspection and tests. What do you use for code inspection? Do you rely on external tools, or local tools only? Maybe both? Let us know!